Choosing the right vodka gift for the distinguished distiller is a fine art in itself. Because there is such a wide range of vodka available, it can be a tough choice to pick the right one, especially if you’re not much of a spirits expert yourself. That’s where we can help. 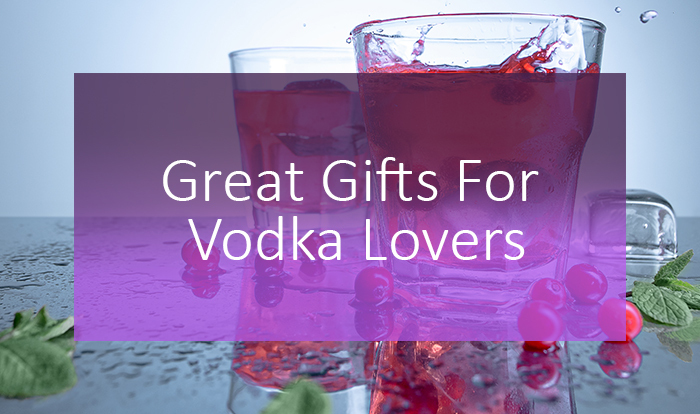 We have spent a long time choosing top of the range vodka gifts to include in our three premium vodka hampers. 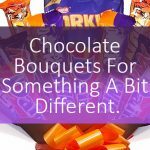 Take a look at the selection below. 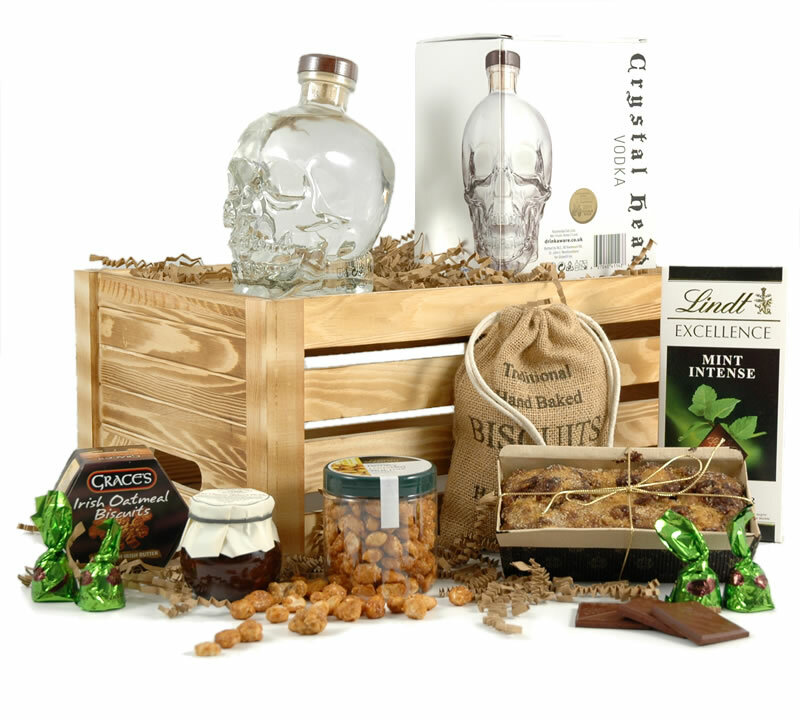 One of our most popular vodka gifts, this hamper has it all. It contains the award winning Belvedere vodka in it’s infamous bottle, housed inside a dark wooden crate. 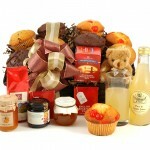 Surrounding the exquisite bottle is a host of luxurious treats. 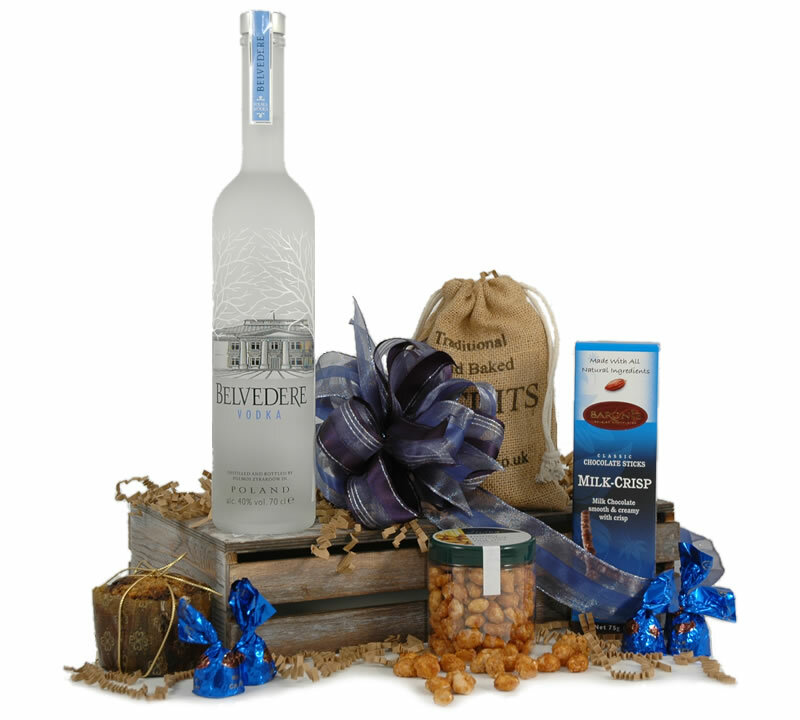 Honey roasted peanuts, gourmet cookies and fruitcake are just some of the delights they can enjoy with their vodka. 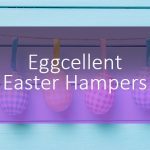 Gift-wrapped with a beautiful blue ribbon, you can have this hamper delivered straight to their door with a personalised message included. The unmistakable skull shaped bottle alone is instantly eye-catching in our Crystal Head hamper. This premium quadruple distilled vodka created by the great Dan Aykroyd has received wide critical acclaim around the world. This vodka is filtered through semi precious crystals resulting in an extra pure spirit. Carefully selected goodies surround the infamous bottle. 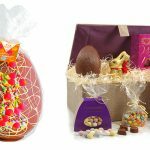 Treat the recipient to a fine selection of cocktail oatcakes, rich fruit cake, chocolates, cookies and more. If you really want to make an impression, the DQ Vodka hamper is the one for you. 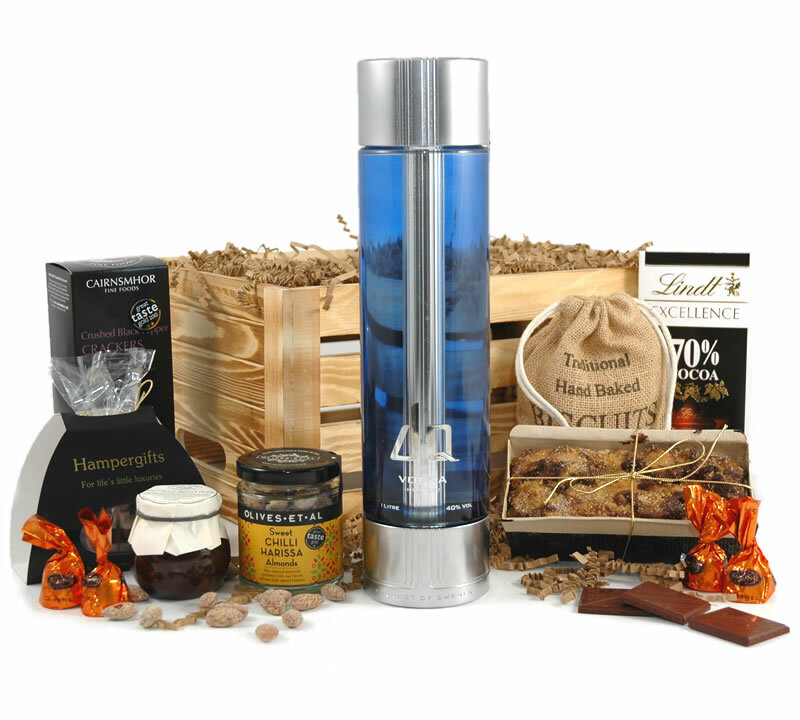 Wow them with this impressive hamper containing the instantly recognisable DQ vodka bottle. 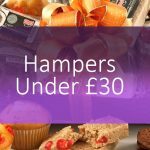 The premium presentation makes this vodka hamper the perfect gift when you want an added flair of luxury. We have carefully selected lots of delicious gooodies to surround and compliment the vodka. 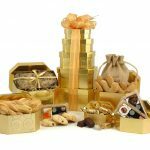 Treat the lucky recipient to award winning foods that will bring their taste buds to life. 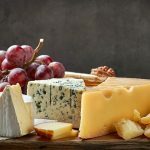 Each item has been hand selected to pair beautifully with the silky smooth DQ vodka.